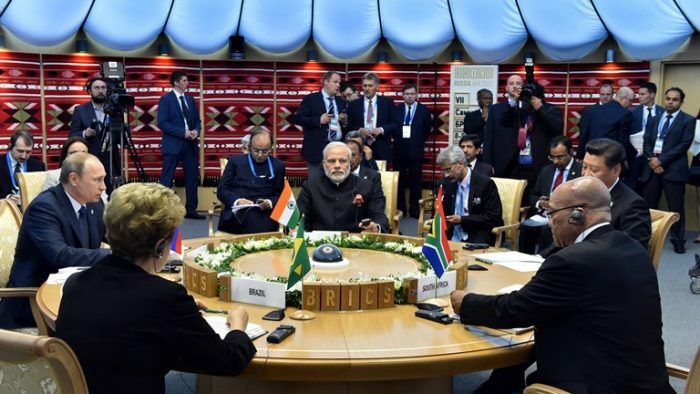 Closing the Second Cycle in BRICS: A Surprise or Business as Usual? All the BRICS countries are either at a major turning point or going through various processes of political, economic, and social transformations and speculations of various degrees continue of how each internal or external process will influence the whole of the BRICS grouping. Among other issues, it is worth considering recent elections in Russia and the course set for the country, which became clearer not just with the elections themselves – hardly anyone doubted the outcome – but rather with the appointment of the new government. Stability and continuity, the two words appropriate for description. This year is the jubilee year for BRICS – this is the end of the second hosting cycle, when the latest-coming South Africa has come out as the chair of the group. Over the years, the BRICS has also become more orderly and got established rules of its own: settled the presidency periods, reached the status of global agenda setter, established its own outreach formats and gained reputation among the developing countries. On the one hand, at the time, global and internal fluctuations are believed to have the BRICS shuttering. On the other hand, it is exactly the flexible “club” format, that allows the group to survive temporary ups and downs caused by a variety of factors. That said, it is high time to look into the state of affairs of the grouping before the 10th Summit takes place later this year in Johannesburg. What is it that we see in each of the BRICS countries, as mentioned earlier and opposing to what was seen at the beginning as their common ground – different paces of moving forward into the global agenda and varying degrees of internal and external political confidence. The quite solid position of the leadership in Russia, China or India stands out, even if all, especially the first two to a different extent, are involved in the global competition and economic and/or politico-military confrontation with the group of the rich developed countries, the so called Golden Billion. At the same time, we see relatively uncertain cases for Brazil and South Africa with regards to their path forward due to internal fluctuations. Ongoing crisis around Brazilian domestic politics, that came in open fire after the ousting of Dilma Rousseff, the weak position of Michel Temer’s government, and more so – ongoing judicial procedure against Lula da Silva, a former president, and his continuing resolve to run for the next elections even counter to court decision – leave the once almost undoubted Latin American leader on a shaky path with an unclear future. This could lead to extra challenges for the BRICS, which is to be hosted by Brazil next year and is vulnerable to neglect and low profile if the situation does not stabilize by the end of this presidential term. This could have been hedged by the Sherpa and MFA team, allowing for business as usual, no matter who comes out as the leader of the country. But not in the case of Brazil, which has overwhelmingly conservative officers in the Ministry and is rather oriented for cooperation with IBSA (India, Brazil, and South Africa Forum) and the West with lower priority given to BRICS issues. The situation in South Africa, with the resignation of Jacob Zuma in February and the incoming of the new President, Cyril Ramaphosa, has its own difficulties. While the new President is seen as the champion of the fight against corruption and someone able to lead long-awaited reforms, the current economic situation in the country does not give much optimism – the country is found in the situation of practical stagnation with 1.1% of maximum growth to be reached in 2018, according to the World Bank estimates; 10% of the 55-million population has control over 90% of the country’s wealth, etc. At the same time, the change of power itself does not seem, so far, to have much of an effect on the BRICS chairing, with the continuation of all the main formats and the priority agenda being rather forward looking. The topic of the Summit remained focused on inclusive growth and shared prosperity in the age of the 4th Industrial Revolution – center stage of global deliberations. The South African presidency aims to launch a number of new cooperation schemes, including a working group on peacekeeping, new initiatives on health management, as well as fostering the topic of women empowerment. All of those issues were kept for consideration, but the resulting document and resolve to pursue the decisions reached are to be evaluated later when first results come to fruition. It probably brought a little less certainty about a number of newer outreach formats (Women outreach is still in the making) and expectations of a more cautious stance of the new President. At the same time, the internal political situation in the other three BRICS states is of more stability and predictability, which ensures sustainable foreign policies as well. The decision to remove the limitations on the duration of tenure of the Chinese leader, Xi Jinping, this March did not cause much international negative reaction. On the contrary, for example, President Trump called this move “great” and even mentioned the possibility to “give it a shot one day” in the USA. The next parliamentary elections in India are foreseen for 2019, while the strong position of Narendra Modi and last year’s Presidential elections, which led to the victory of Ram Nath Kovind (someone starting from an underprivileged section of society and the Dalite), only strengthened Modi’s populist stance supported by efficient economic policies. Today, both China and India compete for the first places in the world economic ratings – if rated by PPP, China’s GDP stands first and India third globally. Russia recently went through its Presidential elections and the appointment of the new, but in a way old, government. Vladimir Putin’s victory in the elections was hardly a surprise for anyone either inside or outside the country. While there were some expectations of new faces in the government, this, rather, would have had internal implications and could barely influence outcomes of the main international events. What we are to see is the obvious continuity of international communications of President Putin – the foundation of his policies remains stability and sustainability – both internally, and externally especially since he could allow this, due to wide support he himself and his policies have by the Russian population. This support stems from a state of stability as the opposite feature of chaos that was seen in Russia economically and socially in the 1990s; the same feature of stability applies to foreign relations of Russia with the other countries. While in order to achieve political détente with the West there will be the need of explicit concessions on both sides, we are unlikely to witness serious breakthroughs in the short-term. It is also seen as good to have the same President at times of need of consolidation against pressures from the non-friendly Western countries, mostly featuring Anglo-Saxon world. At the same time, the Russian President is here to demonstrate positive continuity as well. While it will take ten times as much efforts on both sides to overcome existing confrontation with the West, it is much easier for Putin to continue deepening relations with the leaders of the rising rest, especially the ones he established great relations with during his earlier term (and as we know, clubs are mostly about trust and good personal relations among its leaders). Another very important aspect, relevant for the strength and efficiency of any international club, is the strength and internal legitimacy of country member’s leaders, which offers good prospects for the BRICS to have their decisions implemented. We have the two strong leaders of Russia and China having friendly personal relations (the best example cited was the presenting of Russian ice-cream to Chairman Xi, who is a big fan of this desert). Both are confronted by the American superpower, both eager to bring bilateral relations to new heights, and contribute to safeguarding a multifaceted global order featured by multiculturalism, stability, and diversity, both active in promoting international institutions that are able to promote alternative views from all actors present on the scenario. We have pragmatic and wise Indian Prime-Minister Modi, who proved unwilling to be played as the trump card against the current American-designated Chinese opponent. Obviously, difficulties between the two countries experience in territorial and maritime issues is often seen as the most possible scenario to start skirmishes between the two giants. Nevertheless, the two countries have had a very productive series of meetings and outcomes in the recent Shangai Cooperation Organization (SCO) Summit, which proved those hopes from the West for rising confrontations futile. Russia and India at the same time have a smoother path of friendship not overshadowed by serious misunderstandings of political or military kind (although there are issues like Pakistan or too close relations with China that bother Indian counterparts). While there is still existent dominance of the political agenda over the economic one, with the two leaders in power, we see the gradual upscaling of business ties of the two countries. Even though economic and trade cooperation needs further impetus to get a real go. Personal relations of the two leaders also remain very warm, having personal encounters not just within multilateral groupings, but meetings for the bilateral agenda as well. That said, nothing is bound to hamper fostering further relations within the BRICS, the G20, or the SCO by the newly reelected President Putin and the two Asian giants. Could the same be claimed of the other two partners, mentioned in the beginning, the ones experiencing political unrest and in the process of uncertain transformation from previously very pro-BRICS leaders to someone unknown? Here we see two main components to discuss – relations with Russia of BRICS partners, on the one hand, and the attitude towards the BRICS as a phenomenon, on the other hand. Brazil seems to be more in conundrum and in need of settling its internal affairs first, without taking sides within the ongoing global divide, at least until we see the final outcome and the possibility of Lula da Silva to return to power or of another strong candidate, able to consolidate the country, to emerge. Relations of the two Presidents – Russian and South African – are still to be seen, but there is one thing that needs to be remembered. Indeed, currently, pro-Western media in South Africa has an ongoing really severe anti-Russian campaign. Indeed, President Ramaphosa is from the Forbes list and is closely engaged with big transnationals like McDonald’s or Coca-Cola. But at the same time, Cyril Ramaphosa used to be one of the activists of the anti-apartheid movement, and most of the people who were part of this struggle remember well the role of different countries in this process, as well as the contribution of the Soviet Union towards the attainment of their long-awaited goal to have their own country for themselves, but not for the ruling minority. If we talk about the importance of the BRICS as an entity, this wouldn’t have changed no matter what the personal or ideological changes within the ruling elites in the five countries are. BRICS is the global club, that allows its member-countries to have a louder voice in the international arena and offers additional benefits (but also responsibilities) of first-tier global players. Will anyone be willing to give this up? Personal views of political elites could be different, while reality offers us ten years of BRICS together and even more consolidated than other comparable institutions, if judged by real achievements (enough to cite the New Development Bank launch). Thus, if we remember the first decade of the G7 existence back in the 1970s-1980s, when those seven countries, having very similar political and ideological systems and bonds, couldn’t arrive at tangible economic cooperation schemes (it should also be mentioned, that this first period of time, five of the seven countries of the club retained exclusive finance ministers meeting, not allowing Italy and Canada in until mid-1980s). BRICS is and will remain an important factor of global politics championing inclusivity, sustainability, fairness, and incremental reform in the interest of the world community as a whole. While like any other international body it will continue to live through waves of higher and lower relevance for its members and the outside world, as well as varying degrees of internal integrity, determined by subjective (e.g. personal interactions of the leaders, their position vis-à-vis the rest of the world, etc.) and objective (phase of economic development, technological patterns, etc.) factors. BRICS has by now turned into a brand. This brand imposes responsibility on its members to respond to global challenges and serves the interests of the global community – the case when collective brand influences the individual brands of each country making it impossible for each of them, individually, to fail their collective responsibility and collective role. Russia with Putin as its leader, as well as China with Xi as its leader, as well as any other of the five countries are no exception to the case – long-term evolution of the BRICS and its role for the global community is to remain constant positive trend. World Bank data available here. World Bank predicts just 1.1% GDP growth for SA in 2018. More information and data on South African economy could be found in “YUAR: uspekhi I problemy razvitiya” (South Africa: successes and problems of development), January 2018. Even though we could cite recent rise in cooperation between Russian and Indian companies, like that of Rosneft and ONGC Videsh Ltd., Tata Power signing agreement with the Russian government on investments into the Russian Far East, quadrilateral cooperation with the KGK Group etc. Alexander Galushka interview to Economic Times, January 11, 2016. One of the vivid examples would be Sunday Times publication on alleged intervention into the reshuffle of the South African cabinet. “Russian Foreign Ministry comment regarding an item from South Africa’s Sunday Times titled ‘From Russia with love: How Putin had a hand in Cabinet reshuffle’”, November 1, 2017. Victoria V. Panova is an Associate Professor in the Department of IR and FP at the MGIMO, University MFA Russia. She holds a PhD in history of IR. Since 2003, she is Regional Director for Russia of the G8 Research Group based at the University of Toronto (Canada); since 2010, she directs the MGIMO-UT Fund. She is a member of the National Working Group of the Civil G8 project (2005-2007); she is part of the Common European Security project initiated by High Commissioner J.Solana in 2009. She is currently a member of the Scientific Council/Chief Advisor on Strategy Planning for the NCR BRICS, a member of the working group for Civil 20/8, co-chair for the Civil BRICS, and a permanent member of the Jury for the Youth 8, 20, BRICS. Dr. Panova publishes in a variety of national and international journals. She is a Visiting fellow at University of Cambridge (2007), London School of Economics and Political Sciences (2008-2010), and BRICS Policy Center (2012). Dr. Panova is also an alumna of the Asian Forum on Global Governance organized by ORF (India) and Bucerius School/Zeit Stiftung (Germany).